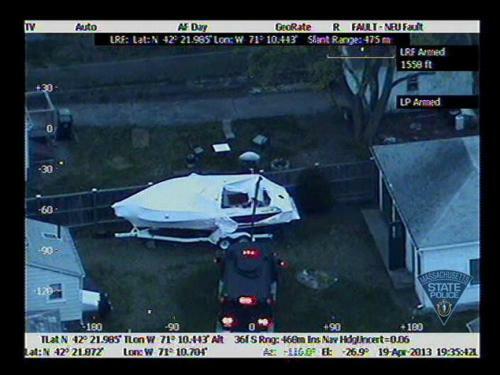 Also the blood that the boat owner supposedly saw doesn’t show up anywhere until after Dzhokhar was taken into custody. Is he getting in the boat or out of it? If he is getting in, where did the image come from? If he is getting out (more likely, you can see the tears in the tarmac from the robot), then when was he injured? This doesn’t look like someone with a life threatening throat injury. First they said he was shot during the shoot out in Watertown, then they said he put the gun in his mouth and tried to commit suicide in the boat. Either way, when was this taken?